Call us today to discuss your upcoming concrete project! 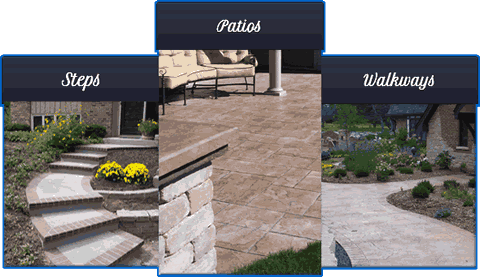 Our experienced staff creates outdoor living spaces that work for you because they are based on YOUR needs. We consider every option and by listening carefully we bring your vision to reality. Skilled, experienced concrete finishers and masons are the key to a successful installation. We are proud of our 25 years of providing outstanding installations and our dedication to excellence means that you are the recipient of a superior product. By listening carefully to you, paying meticulous attention to details and having an open and on-going dialogue throughout the entire project, we will provide you with a finished product you will be proud of..
Stecker Construction was founded in 1988 with an emphasis on concrete installation. We are a family owned and operated company that serves home and business owners throughout southeastern Wisconsin. Our residential services include designing and installing outdoor living spaces such as patios, pool decks, and seating areas. We specialize in decorative concrete techniques. We also install new driveways, service walks and garage slabs. In addition we do foundation repair and renovation and remove and replace existing concrete. Our commercial services include poured concrete foundation walls, interior floors and exterior flatwork. Our crew members bring, on average, 20 years of experience to every work site. We use the highest quality materials. By using proper placement and finishing techniques we produce projects that look great and perform well for many years. Our sales, estimating, and design staff responds quickly to your requests, listens carefully to you and keeps you informed throughout the entire project. Our attention to details produces exceptional designs and solid results.